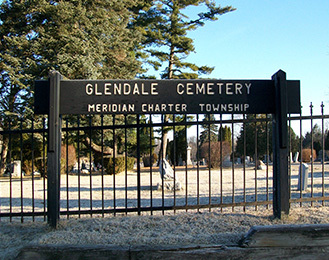 Glendale Cemetery was established in 1887 on land of R.P. Soule and J. Blakley in the lower adjoining corners of sections 20 and 21. It is now 19.5 acres is size. The earliest date of death for an adult in this cemetery is that of Lester B Callahan 1840-1862. Mr. Callahan was known to have been mustered out of service on August 7, 1861 after three months of obligatory service (so was not a battle casualty). His marker probably is a posthumus memorial. The records of Hannah S. and Clara W. Parker dated 1856 also must represent posthumus memorials by their parents. It is more likely that the first actual interment was Eliza Ann Doolittle, who died April 22, 1887. Eliza is listed in Ingham County Death Records as Louisa A. Doolittle. The cemetery, as now developed, has over 9,000 grave sites and records of some 5,000+ burials.The gates are open from dawn to dusk.